1 - 2.0 ft. oz. SMOOTHING SERUM. 1 - Step-by-Step Application Instructions as pictured. 1 - 12 ft. oz. - 12 ft. oz. PURITY SHAMPOO. 1 - 5.3 ft. oz. SMOOTHING SHINE SPRAY. For highlighted, porous, and fine hair. Contains silk and pearl. Perfect amount of silk to achieve smooth results. CHI ENVIRO AMERICAN SMOOTHING TREATMENT PURITY SHAMPOO PEARL & SILK COMPLEX INCLUDES: 2 bottles PURITY SHAMPOO 16oz 1 bottle SMOOTHINH SERUM 2oz **All of our products are guaranteed fresh, new & 100% authentic! • For colored and chemically treated hair. This unique formula is the key to help smooth and straighten colored/chemically treated hair. • Contains silk and pearl. • Perfect amount of silk to achieve smooth results. This unique shampoo is enriched with pearl powder and pure natural silk. Leave in 3 to 5 minutes. Rinse thoroughly. 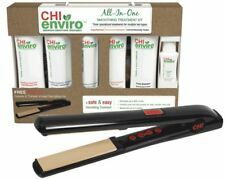 CHI Enviro Purity ensures the pH level is optimal for better results and longer lasting smooth hair. CHI ENVIRO MASQUE. Silk proteins penetrate hair to condition and create incredible shine. This conditioner will leave your hair free of tangles and with incredible body and exceptional shine. CHI ENVIRO PEARL & SILK COMPLEX SMOOTHING TREATMENT - 16oz - YOU CHOOSE TYPE! Silk proteins penetrate hair to condition and create incredible shine. This conditioner will leave your hair free of tangles and with incredible body and exceptional shine. A hair smoothing blowing out spray.Formulated with pearl & silk amino acids that add exceptional shine to hair.Delivers superior moisture from the inside out while regulating frizz.Ensures longer lasting CHI Enviro American Smoothing Treatment results.Leaves hair sleek manageable & healthy looking.Ideal for frizzy uncontrollable hair.Paraben-free.